It’s the season of air conditioning in the Northern Hemisphere, which means spiking energy demands. Environmental writer Stan Cox breaks down just what this means in his book Losing Our Cool: Uncomfortable Truths About Our Air-Conditioned World (and Finding New Ways to Get Through the Summer), which came out in spring from The New Press. Even though the majority of people now living in the world’s hottest climates cannot afford air-conditioning now and probably still won’t have access to it in 2050, millions of homes, offices, other buildings, and vehicles on every continent will be newly air-conditioned or be reinforced with beefed-up cooling systems; that will add to energy demand and put greater stress on global efforts to cultivate sources of energy that will not further worsen global warming. In this arena, the United States is the undisputed champion. Already, air-conditioning is approaching 20 percent of year-round electricity consumption by American homes, the highest percentage in our history. In the commercial sector, it uses 13 percent. Air-conditioning by homes, businesses, and public buildings together was consuming a total of 484 billion kilowatt-hours per year by 2007. Compare this to 1955, when I was born into Georgia’s late August heat. That year, the nation consumed a total of 497 billion kilowatt-hours for all uses, not just air-conditioning. We use as much electricity for air-conditioning now as is consumed by all 930 million residents of the continent of Africa. Without the extremes, enjoyment of moderate conditions declines. After I have worked outdoors through a broiling-hot day, I find that walking into a supercooled office or grocery store is satisfying in the extreme—at first. Yet what I look forward to most is that moment at seven or nine or ten at night when, as I’m sitting on a porch or near a window, I feel that first slightly cool breeze come through. It can make all the preceding hours in the heat worthwhile. That, I realize, may make me seem a little daft, but the world provides a delicious spread of thermal variations from which to choose … . Anyone looking to cool their home sans AC should check out the articles and blog posts on whole-house fans and ceiling fans by our sister publication, Mother Earth News. And over at our other sibling, Natural Home, editor Robyn Griggs Lawrence has just written about a superefficient new air conditioner design that’s still five years from market but offers hope that on this subject cooler heads may yet prevail. Image by ToddMorris, licensed under Creative Commons. 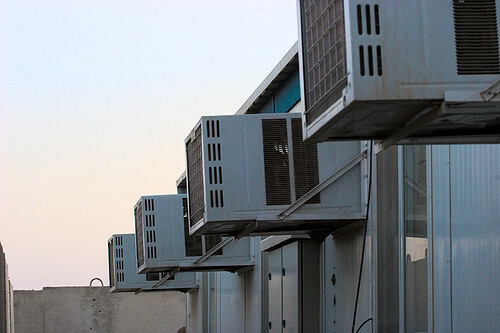 Air conditioners are one off the biggest source of the global warming. It evolves the gases which are causing the increase in the temperature of earth. Try to use Eco friendly ac machines and be a nature's friendly person. http://airconditioner-notcooling.com/ten-tips-to-maintain-the-air-condition/ not only help you in the budget cut but it's one way to the energy efficient future too. Living in the UK, I don't think I know many people at all who have an air conditioning unit in their home. With our consistently lower climate to the US and other continents such as Africa etc, our demand for heating systems such as http://www.underfloorheatingsystems.co.uk, central heating is considerably higher and get much more use all year round, even in the summer months due to the poor climate. This has an equal effect on the energy consumption and a large negative effect on natural resources. You left out swamp coolers. These use much less energy to cool -- They're basically just a pump and a fan. They don't work everywhere, but anywhere there's not too much humidity.